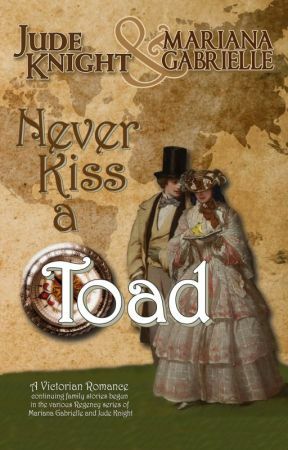 Toad Northope, Marquess of Abersham, leaned his head back against the tub, adjusting a towel behind his neck. He shut his eyes against the dim light of the oil lamp in his dressing room and willed away the headache that threatened. He had drunk enough brandy to feel mildly ill, but not enough to be thoroughly sotted. Not nearly enough to be the friendly, charming, dissolute rogue he knew himself to be. He was hungover before the evening even started. And unacceptable. Only one more night to enjoy himself before he was called to account for being sent down from school—again—and after that, he would surely be confined to Dalrymple House until his father, the Duke of Wellbridge, decided how to punish him this time. He might as well make the most of his freedom. Toad rather hoped that as a college man, he was getting too old to be disciplined like a schoolboy, but he wasn&apos;t sure His Ducal Highhandedness would see it that way. The situation was so very like the one that had seen him sent home from Eton two years ago, and sent off to university early. Only twice as bad. He groaned. God, I hope no one tells my mother. If his parents hadn&apos;t been at Wellstone, and Toad hadn&apos;t been sharp enough to come directly to London when the incensed Cambridge don had packed him into one of the College&apos;s carriages, he would already be under house arrest, and would have heard hours upon hours of lectures on his honor and position by now. As it stood, though, Parliament wouldn&apos;t open until the day after tomorrow, so while his father would appear for that, until then, presumably, no one knew he was in London at all until he showed himself. Three days of silent censure from his father&apos;s ancient factotum, Blakeley, was testament to what he could expect when His Royal Imperiousness arrived to have his say. If the duchess was with him, so much the worse, for Toad&apos;s mother&apos;s disappointment cut in a way his father&apos;s rancor never could. But for the moment, their certain condemnation could be ignored as easily as the sentiments of the servants. He reached out a hand for the brandy waiting on a table nearby. Taking a long draught, finishing the glass, he sighed at the sheer quality and flavor of his father&apos;s best. He refilled his tumbler, wondering whether or not he should arrange for a woman later, and whether any of his friends were in Town. Certainly, that would be a better way to spend his evening than enduring the disapproval of the help, and he hadn&apos;t been to a London gaming hell or brothel since last spring. He tugged at the bell pull to summon someone to heat more water for the cooling bath, then adjusted the towel behind his head again and took another sip of his drink. When he was master of this house, there would be hot and cold running water, gas lighting, and central heat, and the servants would be trained to keep their opinions to themselves in word and deed. When the door opened, he didn&apos;t even open his eyes, just said, "I need more hot water, if you please, and have someone send up a tray." The voice that materialized made him jump. "What you need is a spanking, it seems, since the little boy has not yet learned what it is to be a man." "Father!" The Duke of Wellbridge—not, at this moment, Toad&apos;s indulgent father, but rather his demanding liege lord—loomed over the tub and his errant son. "I thought you were at Wellstone." At the clearing of a throat, Toad finally noticed a second person had trailed his father into the dressing room: the Duke of Haverford, Toad&apos;s godfather and his father&apos;s oldest friend. This could be good or bad, depending on how they had come to find out about his disgrace, and whether the information could be kept from the duchesses. Their wives would be rightly outraged but, as ladies, need not be made privy to every excess of a gentleman.